Mckenna and Gabe each get a box in the mail once a month that has some educational stuff--a new book, an activity/learning book, some projects or crafts or games, stickers or a pen, etc. They are age appropriate and the kids love doing them. I am so blessed that my kiddos love to learn! This month Gabe's used various fairy tales to teach things like completing patterns, sorting and counting objects, size relationships, and others. 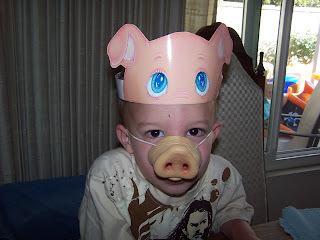 His project was this pig mask. SOOOO Funny. Mckenna's main project was a bean mosaic. She is not known for working hard at something until she gets it just right--that's because she can do many things very well with little effort, often mastering things on her first attempt. 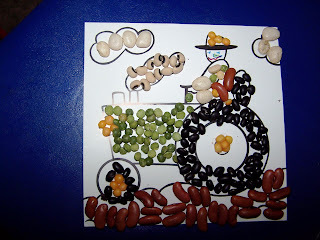 This project took time (sorting the beans, gluing each one), concentration (many were small), and persistence (there were a lot of beans!). Bt she stuck with it and was very proud of the end result, and so was I. She even added he own little concept to the shirt and face after following the directions for the rest. That's my girl. 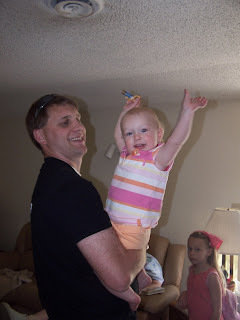 Juliana has learned to throw her arms up in the air when we ask, "How big is Juliana?" and we say, "SOOO BIG!" Often she throws those arms up in the air just so we will laugh and say, "So Big!" She walked a ton today without support. We were at a friend's house and pool and she kept standing up and taking 5-10 steps at a time. 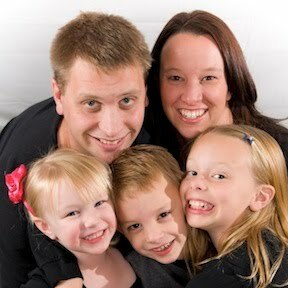 The day is rapidly approaching when she will chase her siblings!